How Much Does A Home Theater Setup Cost? How much do I really need to spend on a home theater system? No matter what you desire in a home theater, your final purchase decisions depend on how much you are willing to spend. What you have already that you intend to use. What you need or want to buy to add to what you already have. What you need or want if you end up starting from scratch. A Sound Bar, Home Theater Receiver, or Surround Sound Preamp/Processor/Power Amp combination that provides all the audio decoding and processing you need (Step up consideration, a receiver or processor that also features video switching and/or both video switching and video upscaling). Loudspeakers (if opting for the home theater receiver or preamp/processor/power amp options and not a sound bar). A basic loudspeaker setup would consist of a minimum of five satellite speakers (front l/r, center, surround l/r) and a subwoofer. All the necessary cables and connectors. A surge protector or power management device with or without battery backup. A very modest system, suitable for a small room, might consist of smaller screen TV (say 32 to 40 inches) combined with a sound bar or home-theater-in-box audio system, and all your other accessories. For this option, you should budget up to $1,000. Of course, if you are using an existing TV, and just purchasing a basic home-theater-in-a-box or soundbar system, expect to budget about $500. For a small to a medium-size room, if you have or buy a 50-inch or 55-inch TV, DVD or Blu-ray Disc player, separate home theater receiver, mid-range speaker system, and other accessories, you should expect to budget between $1,500 to $2,000. 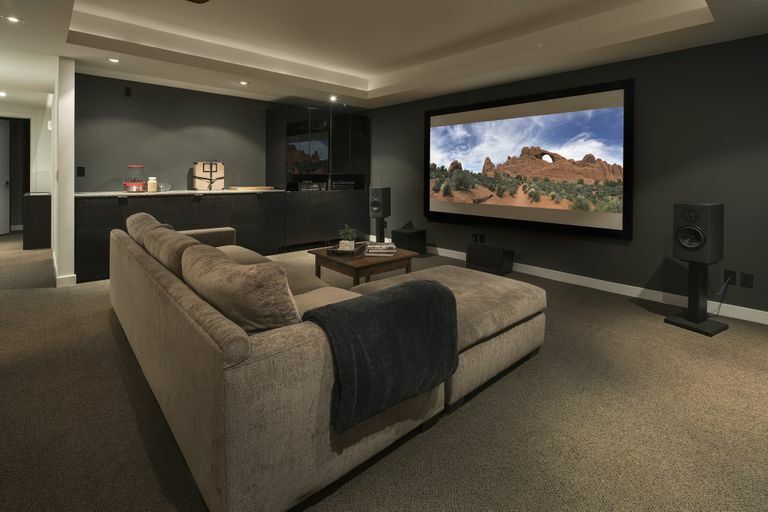 For a medium-to-large sized room, consider a large screen TV 55-inches or larger (LCD, OLED) or even a modest DLP or LCD video projector, as well as mid-range surround sound setup, plan to budget from $2,000 - $4,000. A lot depends on the type and size of TV, brand/model video projector, home theater receiver, and speakers used. However, the cost of a DVD player or Blu-ray Disc player is much less than the other components. If you go for a high-end for a video display device such as a large-screen 4K Ultra HD (65-inches or larger) LCD, OLED TV or a mid-range 1080p video projector and screen, home theater receiver and speakers, definitely budget at least $5,000 - $10,000 for a complete audio and video setup. This includes all the cables, cabinets, and other peripherals you might need. If you are doing minor construction, such as simply mounting speakers on walls, ceiling mounting the video projector, but not actually going into the walls or ceiling for wiring or ventilation needs, you should expect to budget of about $10,000 - $20,000 depending on what level of components you end up using. Of course, the above amounts don't include the cost of any new furniture you may desire for your home theater room. If you are making the plunge into a custom installation with high-end components, that also includes extensive room construction (such as going through walls or tearing out and/or redoing walls) I would budget at least $30,000, or more, for the job (includes construction and all the components) - consult a home theater installer. Just as with any other purchase, buying for home theater components also has its price traps. One price trap is loudspeakers. Many bargain-priced loudspeakers can sound terrible, compared to some that are just are priced just a little bit higher. On the other hand, you might hear a good set of loudspeakers priced very reasonably, but also hear a set of loudspeakers that sound better, but are priced two, or three times as much. The decision you have to make is whether those significantly higher-priced loudspeakers, sound just a little bit better or actually that much better for you to reach into your wallet for that extra cash. Also, with TVs and home theater components, there is the question of brand loyalty. Although familiar brand names may provide good value in terms of features and performance, when shopping, you need to open your mind and check out some brands that you may not be familiar with, especially if you have not shopped for a TV or other home theater component in several years. You may actually surprised at what other brands that you are not familiar with, or considered before, may offer. What you spend really depends on what you want and where it is to be used. The above examples provide a general picture of what to expect - depending the combinations of components and accessories you opt for your budget can vary significantly. Advances in technology and the downward price spiral of components (especially 4K Ultra HD TVs) constantly change what to expect in a potential home theater budget. There are some inexpensive and mid-range options that provide exceptional value and performance, while some very expensive components only deliver a marginal increase in performance and may not always be the best value. A home theater setup can be tailored to your individual needs. There is no single best type of home theater system that is right for everyone, or every home environment. You have lots of options, and that is the way it should be. After all, it is YOUR home theater!